Colmena66 — an initiative of the Puerto Rico Science, Technology and Research Trust — in its first year has signed up more than 200 organizations in its network dedicated to building and strengthening Puerto Rico’s entrepreneurial ecosystem, according to the results of its first Impact Report. The specialized business support network, which is an affiliate of SourceLink, an organization established with the support of the Kauffman Foundation, also has hundreds of mentors, coaches, consultants, investors and entrepreneurs in its network. Colmena66, which also facilitates access to entrepreneurship events and workshops through a collective calendar available on its website, reported the growth it achieved in its first year, increasing the number of organizations on the network by 25 percent. In addition, Colmena66 reported it has answered 415 phone inquiries, received 1,250 requests through its browser and made more than 15,632 connections between entrepreneurs and resource partners on the platform. Colmena66 has two main components: the first one offers the opportunity for entrepreneurs to easily find the resources they need to start or grow their businesses through the Resource Navigator®, a live chat on the website, a Hotline (787-525-4111,) email, and social networks. This way, the nonprofit deals with understanding the needs of entrepreneurs and rapidly connecting them with the appropriate resources. The second component is building the network. Colmena66 identifies nonprofit organizations, academia and public-sector entities that provide entrepreneurial support to whom the entrepreneurs who seek one or more services in the network are referred. Colmena66 also has the function of strengthening our entrepreneurial ecosystem, identifying and addressing gaps, assuring that entrepreneurs always have the support they need. “Providing the right tools to our entrepreneurs is fundamental and it is precisely through programs like Colmena66 and its initiatives that we are achieving and bringing together such an important community to promote, now more than ever, the economic development of our [island],” said Science Trust CEO Lucy Crespo. Among the services most sought by entrepreneurs through the Colmena66 Hotline or website requests are: ecommerce, mentoring, startup support, business administration, sales and marketing, business planning, financial resources and assistance, among others. “Just as beehives serve several purposes such as the production of honey and pollination of crops, Colmena66 has created an infrastructure to support, build and measure entrepreneurship in Puerto Rico,” said Colmena66 Director Denisse Rodríguez-Colón. “That is the basis of every initiative we develop and we are excited that we have already begun to see results,” she said. 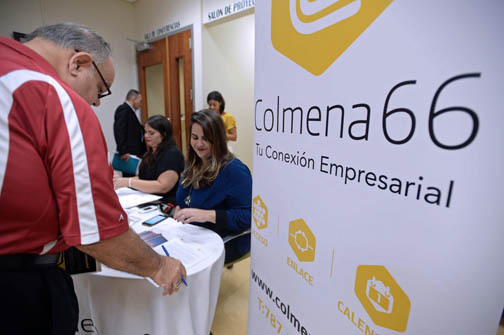 One of the most important goals for Colmena66 is to support all types of entrepreneurs; from the micro-entrepreneur to the innovation based entrepreneur, since they are all equally important for our economy, officials said. After the impact of Hurricane María, Colmena66 took on the task of identifying and responding to the immediate needs of entrepreneurs. Due to unstable internet connectivity and lack of power, Colmena66, with the support of the Science Trust, temporarily enabled a free co-working space for entrepreneurs to operate. In total, 201 companies and 374 people from a variety of industries were registered under this initiative. “Levanta Tu Negocio PR” is another initiative Colmena66 and its network implemented. It consisted of collecting data of all the damages and immediate needs of businesses in Puerto Rico after Hurricane María. The information was gathered online as well as through visits and information session islandwide. Colmena66 worked with partners INprende, Centro para Emprendedores, Parallel18, Grupo Guayacán, Piloto 151, Departamento de Desarrollo Económico y Comercio, Compañía de Comercio y Exportación, Centro Unido de Detallistas, Foundation for Puerto Rico and ConPRmetidos on the task. The report reflects results from 1,132 surveyed businesses from 76 municipalities, representing 34 different industries. The retail industry represented 30 percent of the 34 participating industries and 94 percent of the surveyed businesses have less than 20 employees. When asked about the status of the business after the Hurricane, 43 percent indicated they had already restarted operations, but sustained some type of damage, and another 35 percent said they were temporarily closed. In addition, 66 percent of the participating entrepreneurs indicated they needed between $5,000 to $50,000 of capital to continue operations. To facilitate access to disaster relief resources for businesses, Colmena66 gathered and published a single list of all available aids for our entrepreneurs and business owners. Colmena66 then matched the surveyed entrepreneurs with the corresponding disaster relief resource. Looking to boost the economy and give flight to the sustainability of local companies, Colmena66 also launched the “Shop+Hire PR” initiative, an online directory that gives users the opportunity to shop from a wide variety of local products as well as to hire Puerto Rican professionals who can work remotely from Puerto Rico. So far, there are 181 shops and 187 freelancers who offer their stores and services in one single website. Since its November launch, traffic to the pages of the registered shops and freelancers has increased up to three times, according to traffic data they provided. This tool was launched with the support of the Puerto Rico Trade and Export Company, SourceLink, Parallel18 and the Puerto Rico Science, Technology and Research Trust. In addition to its main purpose, Shop+HirepR has also helped to identify, as an area of ​​opportunity, the promotion of an ecommerce culture in Puerto Rico. Looking to support this effort, Colmena66 will continue to facilitate online store development workshops, so that more people can expand their businesses by exporting their products and services. Shop+Hire PR’s media presence outside of the island has managed to attract a large number of the diaspora and friends of Puerto Rico to use the platform during the Christmas season, executives confirmed. Hey Buddy!, I found this information for you: "Colmena66 reports 15K+ biz connections in 1st ‘Impact report’". Here is the website link: https://newsismybusiness.com/colmena66-reports-connections/. Thank you.